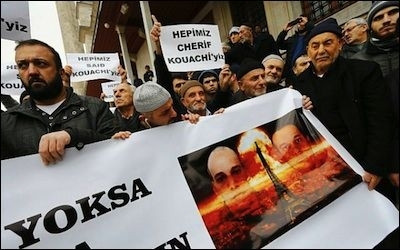 Turkish Islamists: Je Suis Kouachi! Originally published under the title, "Turkey's Dance with Jihadists." Demonstrators praise the Kouachi brothers in the courtyard of Fatih mosque in Istanbul on January 16. "If freedom of expression has no limits, be prepared for our freedom to commit actions with no limits." "We are threatening (you)! Do you dare?" In a similar eulogy, members of the Aczmendi Lodge in Istanbul conducted funeral prayers for the Kouachi brothers and praised them as "martyrs." And a billboard in the eastern town of Tatvan read: "Salute to the Kouachi brothers who avenged the Messenger of Allah. May Allah accept your martyrdom." A billboard in the eastern town of Tatvan reads: "Salute to the Kouachi brothers who avenged the Messenger of Allah. May Allah accept your martyrdom." All of which prompted prominent Turkish columnist Anmet Hakan to ask in the daily, Hurriyet: "Are Muslims who are killed by other Muslims the orphans of the Muslim world?" He was curious why the articles of the Turkish Penal Code that regulate "praising crime and criminals" were never applied to Islamist protesters while Turkish prosecutors, citing the same article, have the habit of indicting thousands of other individuals. Good question. But it will most likely remain unanswered. Forever. The fact is, Turkey's ruling Islamists and their judges probably do not view the Kouachi brothers as people whose praise should amount to offence on the basis of praising criminals. On a de facto basis, perhaps, the Kouachi brothers are not even viewed as criminals. But that should not come as a surprise for a country whose prime minister has just offered a red-carpet welcome ceremony to Khaled Mashaal, head of Hamas' political bureau. Prime Minister Ahmet Davutoglu who, ironically, was among the many statesmen from across the world who marched in Paris for solidarity with the victims and denounce terror, thinks that Israel's Prime Minister, Benjamin Netanyahu, is no different than the Kouachi brothers who left behind 17 dead. Davutoglu said that Netanyahu has committed crimes against humanity the same as those terrorists who carried out the Paris massacre. Insane? 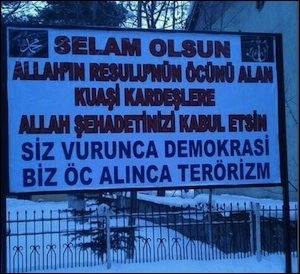 Just Turkish Islamism. Ironically, Turkey's systematic euphemizing of Islamist terrorism comes at a time when the country itself is at risk of being a target of it. Ironically, Turkey's systematic euphemizing of Islamist terrorism comes at a time when the country itself is exposed to the risk of being a target of the kind of men Turks praise as martyrs. Recently, a police intelligence report raised red alert over 3000 or so people in Turkey with links to the jihadist Islamic State [IS], which has conquered parts of Syria and Iraq. The police are deeply concerned over possible future acts of terror by IS "sleeper cells" in Turkey. Worse, those 3000 pro-IS sleeper cell members in Turkey come in addition to between 700 and 1000 Turks fighting for IS in Iraq and Syria. Foreign Minister Mevlut Cavusoglu has admitted Turkey's concern over their potential return to Turkey. If a mere 5% of Turks feel sympathetic to ISIL, it means there are nearly 4 million souls residing in Turkey who feel sympathetic to jihadists. And that is too many. If 10% of ISIL sympathizers in Turkey decided to join the jihad, that would mean 400,000 new jihadists willing to fight across the border in Iraq and Syria, or inside Turkey if they think Ankara allied with the West against their Salafist comrades. Davutoglu should be able to understand that if a terrorist decided to strike Turkey in the name of jihad, his name will not be Benjamin Netanyahu.